The quilt for my neice’s baby is done, and what a coincidence, he was born last Thursday! 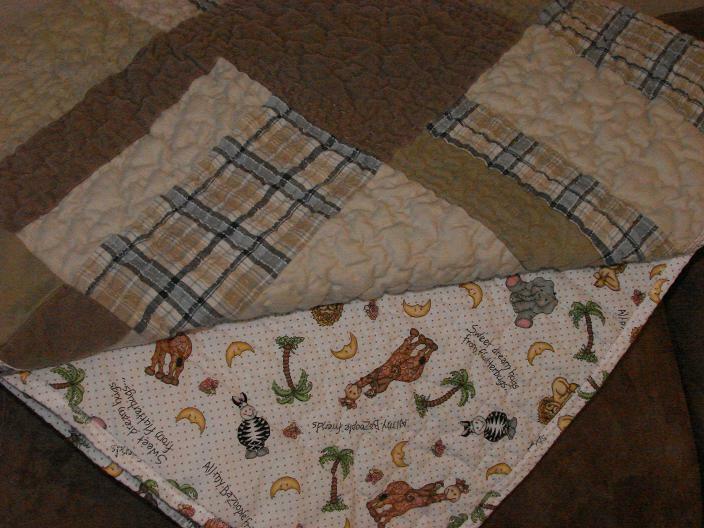 Technically the quilt was finished last Thursday too but I didn’t upload the pictures until just now. Just now, as in I should be cooking dinner but instead, I was uploading pictures and writing this post. What to do with me? This was the result of a few pairs of my husband’s khaki shorts, a plaid shirt, a khaki shirt and a pair of my old cords. I was pleased with how it turned out, it does look nicer in person. 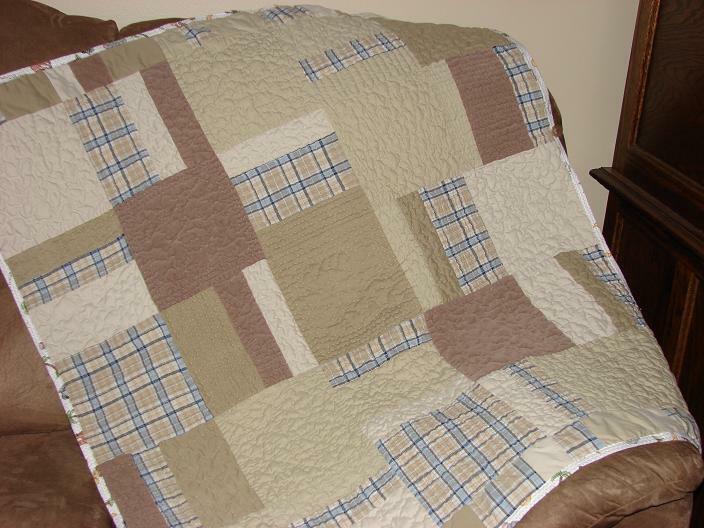 I did all the quilting by hand and a few different designs in various blocks. My favorite blocks are the cordorouys! I love the feel of them. Actually the whole quilt is very soft. I was stumped on what to do for the backing and binding so here’s what I came up with. I’m such a girl that it’s really hard for me to get excited about anything other than cute, flowery, pink, girly things but that doesn’t make the whole world go ’round, does it? For the binding, I did sew it to the back and used a basic zig zag stitch to finish it off. The picture I took of that didn’t come out so well so I didn’t bother posting it. I really like the colors you choose: boyish, yet not blue, lol. I’m expecting my third boy and I’m getting bored with so much blue…I’ll have to add some browns. 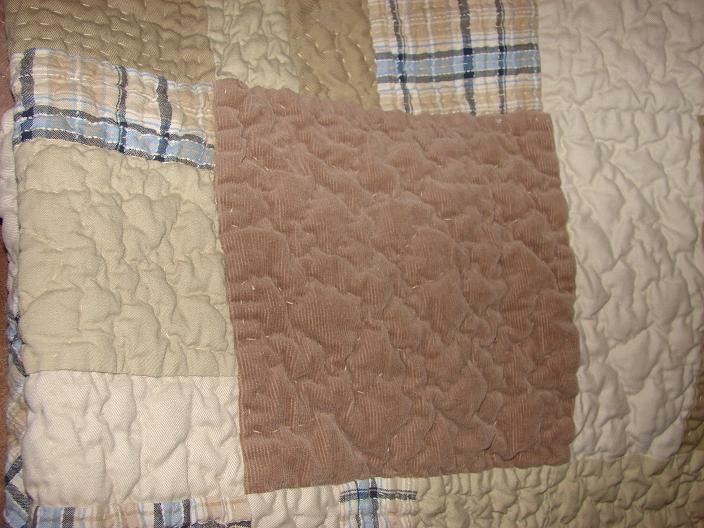 Great job on the hand quilting, too. The whole thing looks great!! 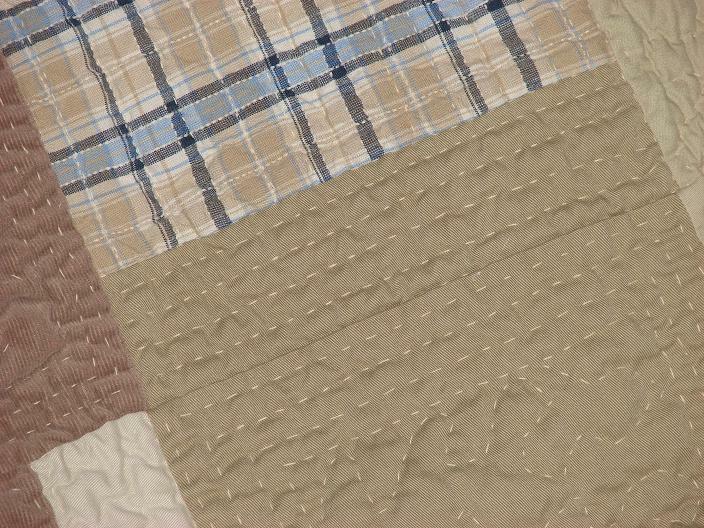 Wow, all that quilting by hand! Great job! Congrats Blueflower in the new baby. I’m sure you are bored with blue. I felt the same way about pink when I was scrapbooking my girls baby pictures lol. Now I’m back to the pink love though and all is well in my world lol. I think this is really beautiful and I love the colour scheme, it’s so soothing. What a lovely gift.